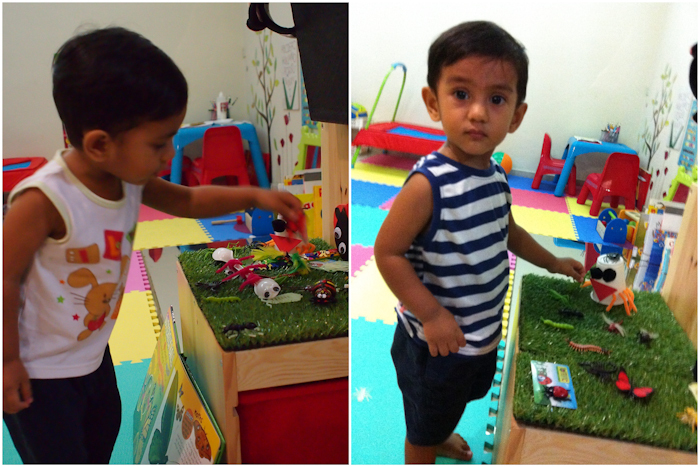 As a prelude to the theme, I brought him to the Singapore Science Center – MEGABugs! Exhibition. It was definitely a treat for him because these bugs are not only MEGA heeeeyugeeee but it gives a good visual how these bugs looks like. 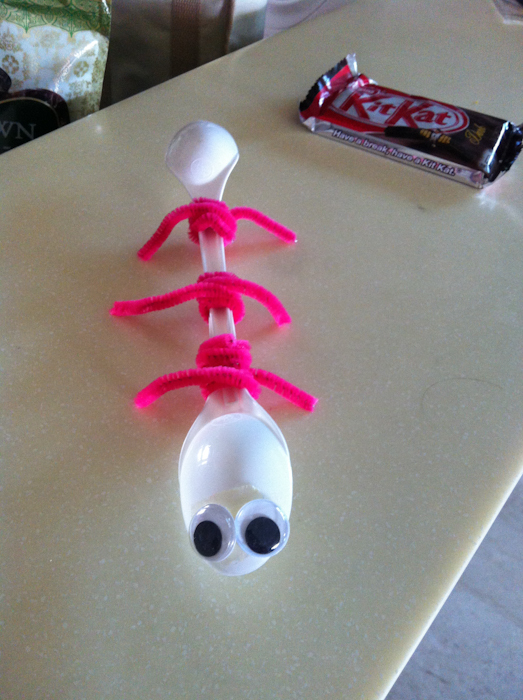 We also brought him to watch BUGS! 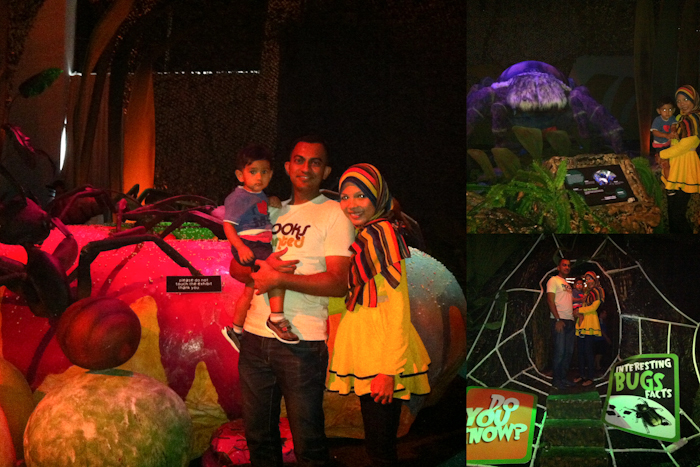 3D – A Rainforest Adventure. He sat through it during the first 20 minutes with his 3D glasses on. 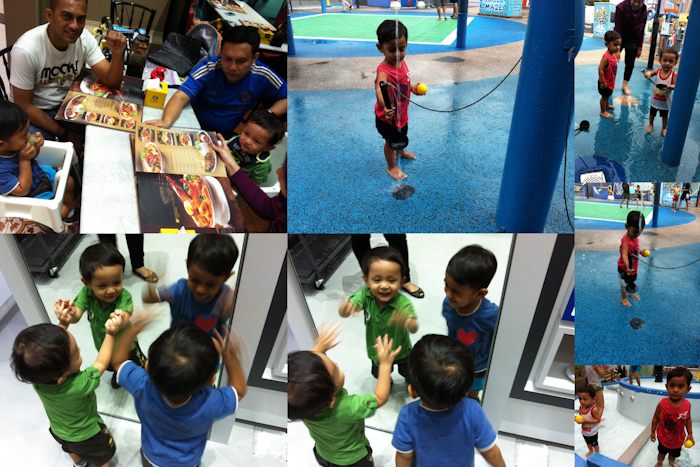 With a no-screen time, it was definitely a treat for him, at least for a while. 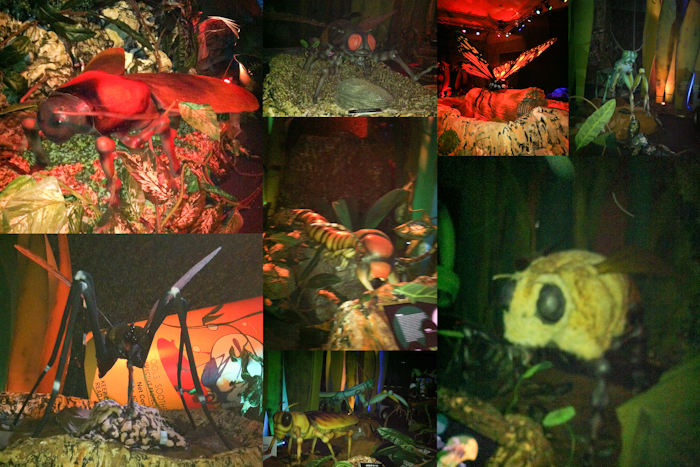 However, I think the 3D images became too intimidating for him as the bugs seemed closer in proximity than usual that he refused to have it on for the rest of the show. 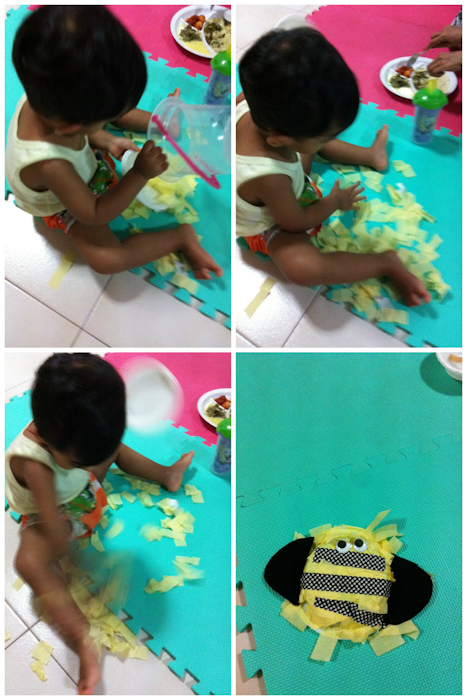 We did a number of crafts in a span of 3-4 weeks. 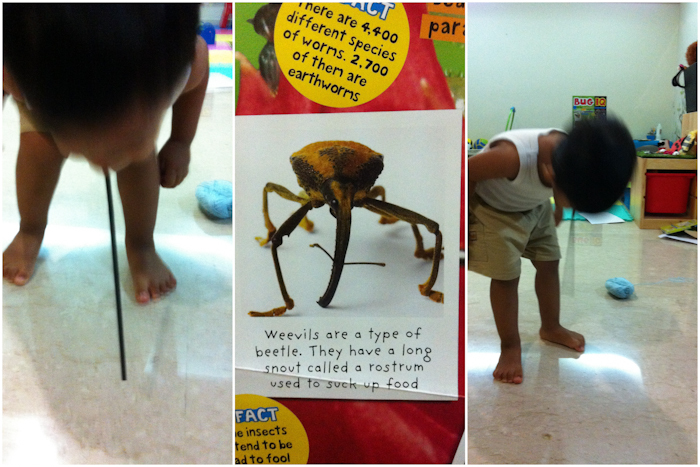 Role-playing a weevil using a straw as his snout! 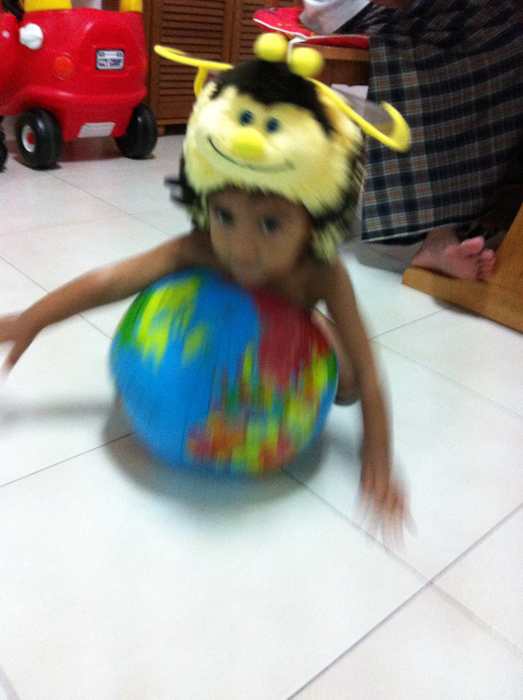 My little bumblebee traveling the world in 30 seconds! 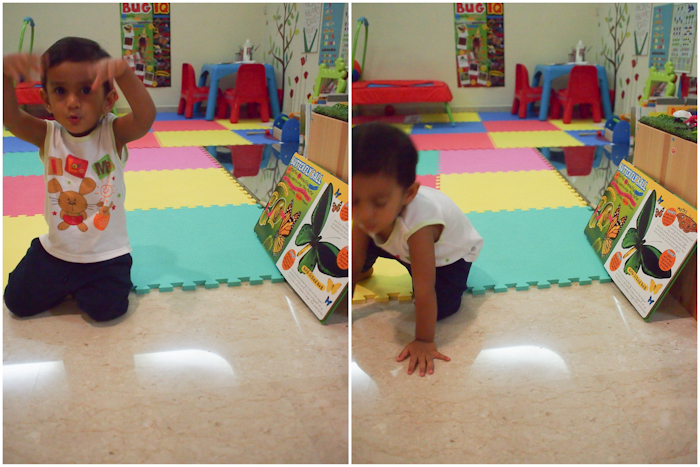 He is role-playing a butterfly by flapping his hands like the wings of a butterfly. For Science Play we did parachuting of a ladybug since he totally LOVE the parachuting sheep in “Where is the Green Sheep by Mem Fox“. 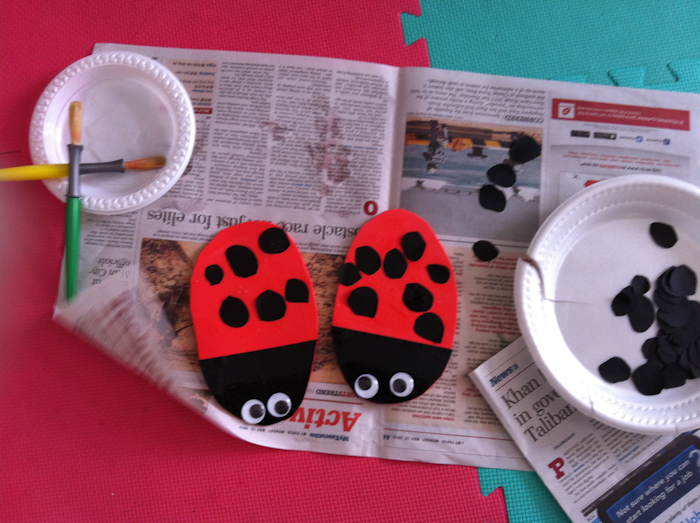 The poor ladybug was thrown down over and over again. 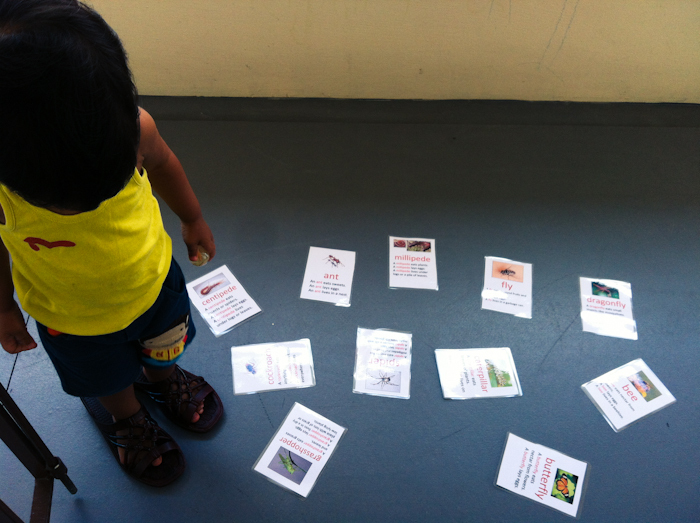 We also did “Find the BUG card” game at the corridor. (One of the days when I was too tired to prepare for anything. 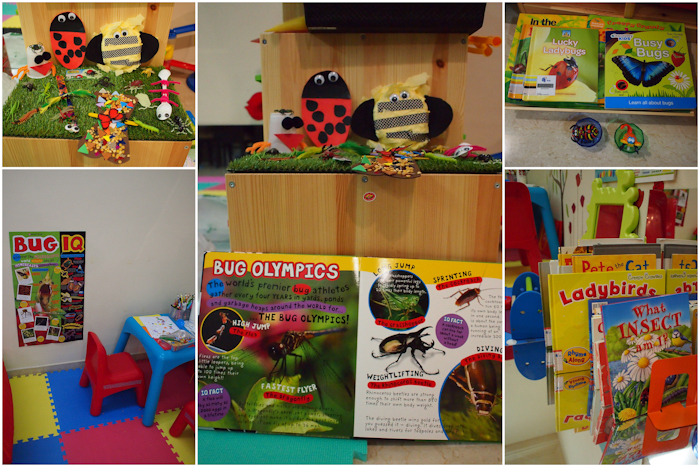 We also read lots of BUG books which we loaned from the library and from Mommy Aida. 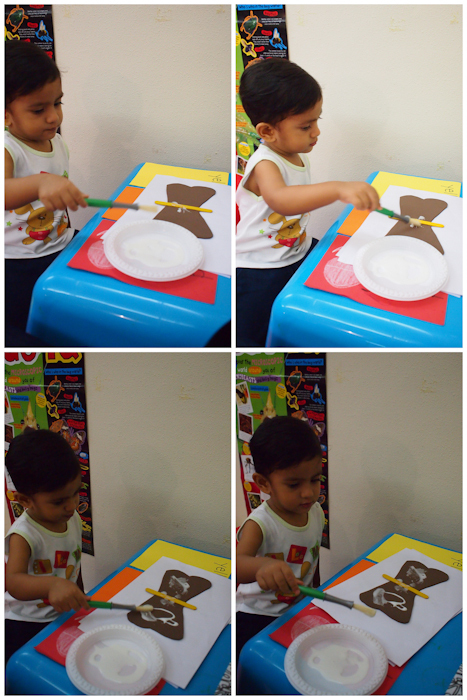 On the last few days, we had some bubble foam play with the water table. 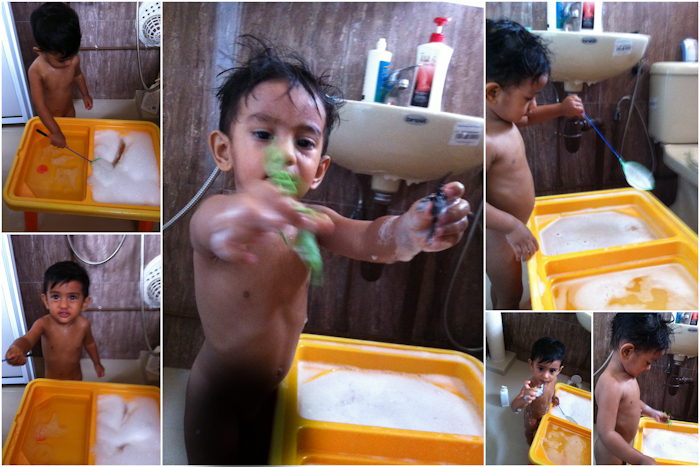 (I had to clean the water table as it was still quite sandy so thought playing while washing will be a better idea.) 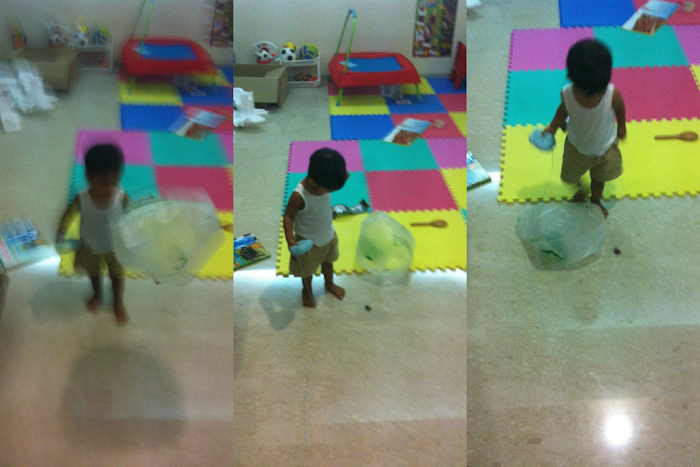 We played fishing for bugs! Bet this is his favorite part of the activity. Here was our final set-up. I can definitely do better. 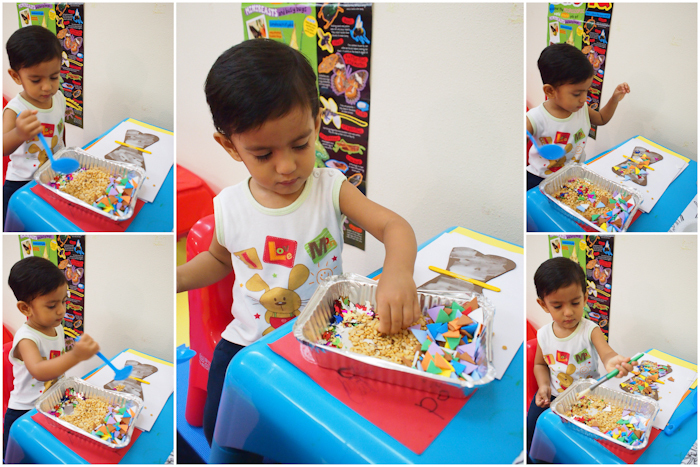 Umar Khalif inspecting his bugs corner and his artwork. 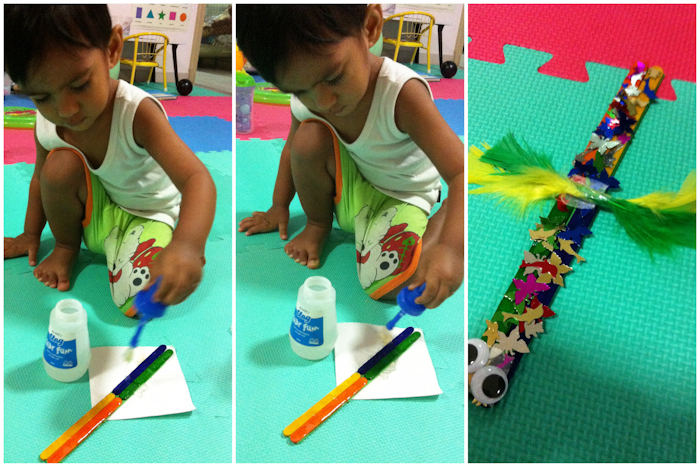 During the day, we will play the audio CD that came along with a Barefoot Book – Creepy Crawly Calypso. 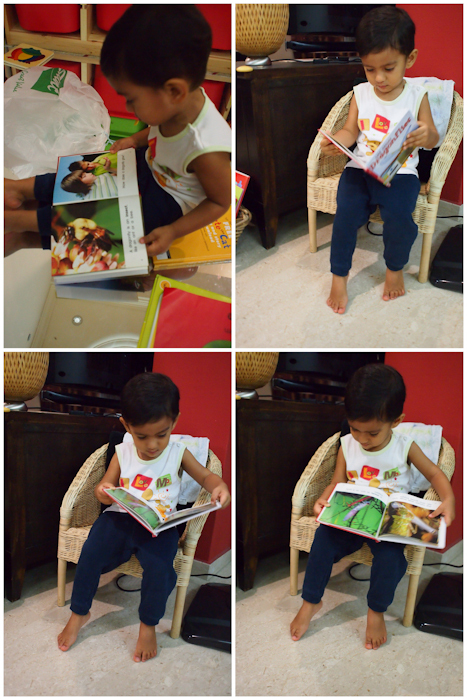 Bedtime stories is either a bug book of his choice or selected stories from the book – Goodnight Stories from the Quran.